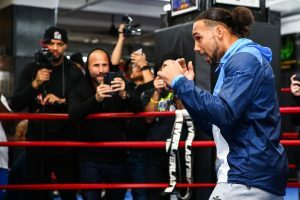 m As fight week begins for the first Premier Boxing Champions on FOX and FOX Deportes event of 2019, welterweight world champion Keith Thurman and veteran contender Josesito López took part in a media workout at Gleason’s Gym in Brooklyn on Wednesday before they headline action this Saturday, January 26 from Barclays Center, the home of BROOKLYN BOXING™. Televised coverage begins at 8 p.m. ET/5 p.m. PT and features additional participants from Wednesday’s workout including rising Polish heavyweight contender Adam Kownacki and former title challenger Gerald Washington, who meet in a 10-round attraction, and hard-hitting featherweights Claudio Marrero and Tugstsogt Nyambayar, who meet in a 12-round showdown. Wednesday’s event also saw unbeaten Brooklyn prospect Chris Colbert, who takes on once-beaten Josh Hernandez in PBC Prelims on FS1 and FOX Deportes that begin at 6 p.m. ET/3 p.m. PT. “We’re back in Brooklyn, it’s been a long time and I’m happy. I feel slim and trim. Everything is great headed into Saturday. “I had a lot of ups and downs, but once we got into camp, we did what we had to do. We slowly improved each day and now we’re ready. It was a slow start, but we’re going to be finishing strong on Saturday. “When I’m outside of the ring, I’m not the jealous type watching other people perform. But I feel better when I’m here living out my dream. These past weeks, I have just felt so good. I feel fantastic and ready to perform. I’m going to be an active fighter and one of the best welterweights in the world today. “My ranking, my ‘0’ and my accomplishments haven’t gone anywhere. I’ve been out of sight and out of mind for a little, but I’m back now. You can’t block a star from shining. We’re in the galaxy and shining bright. “I’m confident in my abilities. Talk is cheap to me. What other people say makes no difference to me. I’ve come here to do a job and I’m going to do it. “I know that I have a tough task ahead of me, but I also know that I can do it. I can pass this test. I’m ready for it. We’ve prepared right and everything is lined up. We worked hard for 10 weeks and now it’s time. “It’s hard to say if Keith will be my toughest opponent, but he definitely has a great resume and is a great champion. I’ve fought some great guys but I’m taking this as the most important fight of my career. “I think that since I started working with Robert Garcia, all of my skills are on par with Keith Thurman. Most importantly, I’m a much smarter fighter than I’ve ever been. I’m always going to be courageous in the ring, but we’ve developed a game plan where I take less unnecessary risks. “It’s going to be a sea of red and white on Saturday. The Polish fans are unbelievable and I can’t wait to go out there and get a knockout for them. “I think I’ve improved my speed heading into this fight. I feel great. It’s been a long camp leading up to this huge card. I have to come out at my top condition. I made a slight statement against Charles Martin, and I’m going to make a bigger one against Gerald Washington. “I definitely want to outdo the performances of Deontay Wilder and my friend Jarrell Miller against Washington. I want to have bragging rights. I want that knockout. “Washington has fought contenders, good fighters and a guy I lost to in the amateurs in Nagy Aguilera. He’s proven that he’s game, and I’m expecting the best version of him. I’ll be ready. “We know where we want to be and we know this is a stepping stone to getting back there. I have to take the hard road and this is it. We’re prepared, we’re ready and I’m looking forward to January 26. “Any of the top heavyweights would be great to fight, but I’m taking it one fight at a time. This is going to be an action-packed fight. “I have the total package. We’ll see everything I learned from my last fights and see if it makes a difference now. “I know that Kownacki is going to come forward. I know what kind of fighter he is. I didn’t come here to lose. I came here to win and get back on the right track and into contention to win the heavyweight title. “We went through a very serious, 10-week camp because we know that we’re here to fight a very strong fighter. I’ve taken everything to the fullest each day with intense work in training camp. I’m ready. “We respect our opponent, but he’s coming to our weight division. I’ve been making this weight ever since I was a pro. In his last fight, he was dropped by Oscar Escandon, who’s a very good fighter, but he’s a smaller guy. “We believe that this is the beginning of something beautiful. I’m going to be at the top of the rankings after this fight. We believe that winning this fight is going to take us back to the top level. “I feel good and strong. I’ve had a great camp and I’m ready for Saturday night. I’m going to give a great show for the fans in my Brooklyn debut. “I put everything into camp and I’m going to show it in the ring on Saturday night. I’m here to win and show off my athleticism. I believe I can do everything in the ring. “Claudio Marrero is a good tough contender who’s been at this level for quite some time. He’s a good boxer who can punch, so we prepared for everything. He may have more pro experience, but I believe I have more boxing experience than Marrero. I’ve seen everything throughout the world. “I’m going to go out there and dominate like I always do. I don’t have any resolutions for 2019. I’m just going to do the same thing and keep being great. “New year, same me. I’m out here chasing greatness. I’m looking to keep winning and work my way to a world title. I’m not just talk, I’m the real deal. “I don’t believe that you can be rushed into a world title fight. I’m ready. I don’t care if I’m considered a prospect for a contender, I’m just going to show everyone that I’m no fluke. I do this differently.